Above & Beyond will premiere their ‘Above & Beyond Acoustic’ concert film on Vice's THUMP channel on January 24, and release a studio album of the same title on January 28, worldwide via Anjunabeats and on Ultra Music in North America. Earlier this year, the group performed some of their best-loved songs acoustically as part of a 15-piece band, across four sold out shows at London's Porchester Hall. The response from fans was overwhelming and led to two sold-out nights at The Greek Theater in Los Angeles in October, described by Billboard Magazine as "one of the finest and more memorable shows in EDM history." Above & Beyond partnered with Vice's THUMP channel on the production and filming of the London shows to create a concert film that captures the Porchester Hall performances and the story behind the acoustic project. The songs performed at Porchester Hall also form the basis of the ‘Above & Beyond Acoustic’ studio album, which was recorded in the spring and summer of 2013 and features a 24-piece orchestra. 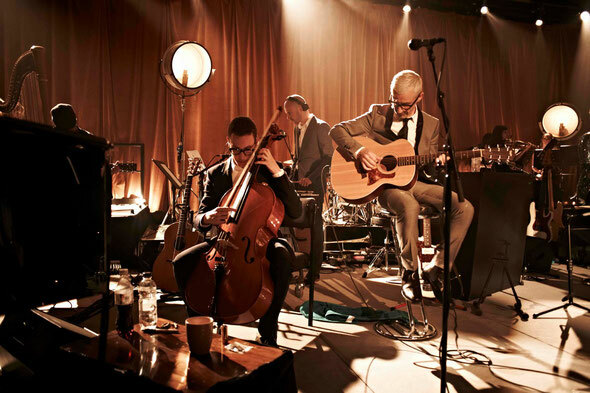 "The acoustic project is a reconnection with the musicians that we were before we met,” said Above & Beyond’s Tony McGuinness. “The songs have been on an interesting journey to get here because we tend to write in a fairly acoustic way anyway. We don't just stick a bit of vocal over a dance track - that's not how we work. We try to start with a song and it's usually only later down the line that we take certain elements from that song and progress them into a more dancefloor-friendly version." With ’Above & Beyond Acoustic’, the group are putting aside their CDJs and lighting rigs to showcase their deeply-rooted musicianship and classical training. Tony McGuinness sings and plays guitar, mandolin and ukulele, Paavo Siljamäki plays the grand piano, vibraphone and cello, and Jono Grant plays the Rhodes piano, guitar and vibraphone.